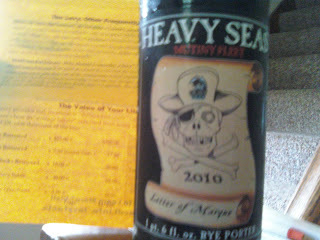 Heavy Seas (Clipper City Brewery) has always been a solid brewery. Their beers have yet to let us down and none have ever been just mediocre (in fact, their Small Craft Warning is our favorite imperial pilsner.) Last year, Clipper City did a homebrew competition called Letter of the Marque where the winner got their brew mass produced for a one-time release. Boston Beer Company (Sam Adams) has been doing these competitions for years (Longshot Series) and usually the victors end up producing better beers than many of their in-house lagers and ales. So when we got our sights on a Heavy Seas version, we couldn't pass up the opportunity to consume their Letter of the Marque Rye Porter. LoM pours a deep amber to an almost black color with a foamy cream head. I has a sweet and citrus smell reminiscent of an IPA. When the rye porter hits the pallet you are left with a unique taste. It has hops and spices of a RyePA but malt overtones of a porter. A medium to full body coats the mouth nicely and and leaves you with a west coast IPA bitterness which is shocking at first but welcomed after the initial sip. This beer succeeds where Nightstalker by Goose Island failed. It balances rye, malt and hops to create something that is unique and highly drinkable. If we were given this beer without a name or style, we'd swear that it was a black IPA. However, this is our first experience with a rye porter and if given the chance to try others, we'd welcome a glass or two. I'm a big fan of this beer.